You are here: Home / Den Talk / In The Den: Random news and thoughts two weeks out from camp. In The Den: Random news and thoughts two weeks out from camp. If you’re a real CFL fan, you’re probably starting to get a need for some football pretty quick. With the majority of the off-season behind us and all its major events done, the only thing left to do is to open training camps in two weeks and start the long journey to Toronto in November. For the BC Lions that means the defense of their Grey Cup title, and judging by the off-season they’ve had, they are in a great position to give it a solid shot. We’ll get to talking about the football soon, but the here are a few thoughts and facts about the last couple of weeks in the Lions Den. The Lions have continued to be very active in the community and the province. Through open houses, season ticket holder kickoffs, football camps and other various events the team has done a fantastic job of coming off the Grey Cup win at home. New ads on transit buses and Skytrain stations are professional and very eye catching. Much of the credit has to go to President Dennis Skulsky, George Chayka and of course owner David Braley for running a first class organization which is apparent whether you’re dealing with their ticket staff, players and even by their solid social media presence. Things are pretty good in the Lions Den right now, and somewhere Bob Ackles is smiling. Let’s hope it all translates to more fans in the stands. One week after an open house at BC Place, the Lions invited their season ticket holders back for a kickoff event to the 2012 season. Fans picked up their season ticket holder packages and listened to speeches from Chayka, Skulsky and Coach Mike Benevides while several players were on hand to model the latest Lions merchandise. Fans had a chance to go on the field and get autographs from the players, and tour the Lions dressing room. The event was well run, but it would be nice to see the event evolve to be a true state of the address of the team, with a more comprehensive Q&A session between season ticket holders and management/coaches, similar to what the CFL commissioner, Mark Cohon, does at Grey Cup each year. This past week saw the Lions hold their annual media conference call with the media. While working stiff bloggers like me couldn’t take part, the always solid Andrew Bucholtz from Yahoo Sports’ 55Yardline blog had a nice recap here that is worth the read. Club Orange is a newly renovated area located in the east endzone of the building on Level 300 (suite and club lounge level). It is a restaurant style lounge with a variety of seating options available. A season ticket in this area includes tapas/light-fare food in the ticket price, available from walk-up action stations in the lounge. Passed hors d’oeuvres from servers will also be available. The menu options at the action stations will change from game to game but include options such as fresh pasta, sautéed prawns/chicken, carved items, grilled items, sliders, salads and more. There is also a private bar in Club Orange. Enjoy a full wine list with international and local wines, as well as premium malt liquor options and local and international beer including Budweiser products (please note, alcoholic beverages are an additional charge to your table or directly at the bar). Various food and dessert stations will also be setup for your enjoyment. The Lions have several special nights planned for this season. Here is a schedule of the events planned for this season. 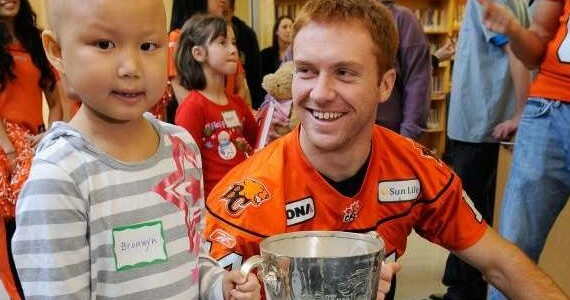 June 29th – Celebration of Champions Night: Opening night and Grey Cup 2012 banner raising. July 6th – Wall of Fame Night: Nick Hebeler and Rick Klassen are inducted. July 20th – Brent Johnson night. August 19th – Celebrating the heart of a champion. Celebrating Wally Buono. October 6th – A salute to amateur football. November 3rd – In Remembrance – A salute to our veterans. There will be a BC Lions coin released this year to celebrate the 100th anniversary of the Grey Cup. Well we’ll have some preview blogs prior to training camp. We’ll have tweets, pictures and blogs from training camp and Fan Fest June 7th to the 10th. Blog ya later Lions fans! It’s almost time to roar again!